This photo shows Main Street in Pandora in 1918. First National Bank later purchased the barber shop along this road. FNB was chartered one year later, on April 23, 1919. First National Bank’s original bank notes included the bank’s name. Todd Mason, third from right, stands with the staff at First National Bank’s Pandora branch. FNB’s first office opened in Pandora 100 years ago. To highlight its 100-year anniversary, First National Bank will be making check presentations to local charities Friday at four of its five branches. First National Bank of Pandora was founded by C. Henry Smith and J.A. Huffman. FNB’s 30 original stockholders were C.A. Grismore, M.I. Trostle, Dr. P.D. Bixel, Noah Schumacher, P.C. Steiner, D.B. Basinger, C.C. Wehrly, Steiner and Neuenschwander, D.C. Steiner, Edwin Diller, P.C. Suter, Henry Wehrly, L.S. Hatfield, J.G. Reese, J. Kempf, John W. Moser, Menno Schumacher, Amos Lugibihl, W.A. Cherry, O.T. McDowell, D.L. Shalley, Henry Diller, Louis W. Basiner, Elmer Campbell, C.H. Smith, John Bixel, J.A. Huffman, P.E. Whitmer, S.S. Bixel and Laura I. Smith. 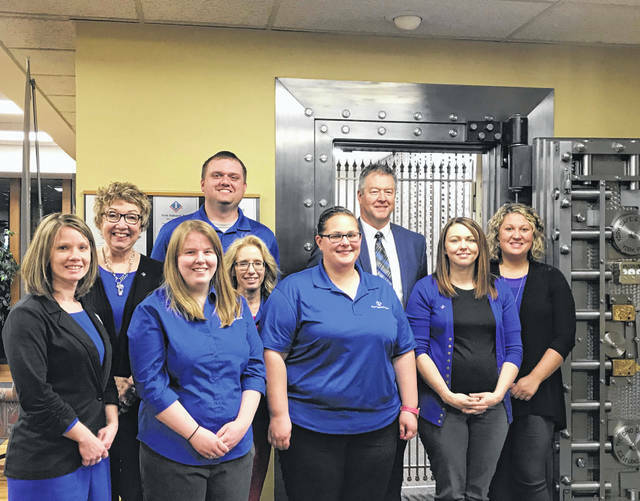 PANDORA — First National Bank of Pandora was chartered 100 years ago on April 23, an occasion which the community bank is celebrating throughout the month of April. It started with just $30,000, after each of FNB’s 30 founding members agreed to deposit $1,000 to open the bank. Today, FNB claims $175 million in assets and five branches. “The thought process then was that a community bank, to survive, had to be owned and operated by the community itself,” said Todd Mason, FNB’s president and CEO. Mason said FNB’s founders believed the bank needed to stay rooted in communities with “strong economic resources,” but the founders also held morals and religious character in high regard. “They said, the only way a bank would survive was through morals, religion and high-grade citizenship,” Mason said. The bank has changed since its early days. Most loans were small, often used to purchase livestock or agricultural equipment. Technology was limited. Few checks were written. “People didn’t transact that much business (then),” Mason explained. In the Depression era, FNB asked stockholders and depositors to waive claims and investments to keep the bank solvent. These claims were later reimbursed with interest, according to FNB biographical materials. FNB even avoided major expansions for decades. The bank acquired The Farmers Bank in 1992, but it wasn’t until 1990 that FNB opened its second branch, in Bluffton. The next three decades saw three additional branch openings in Findlay and Ottawa. FNB is the only bank with an office in Pandora. But the community bank has seen increased competition in its other markets in Bluffton, Ottawa and Findlay, including from major banks such as Chase. To stay relevant in a fractured market, FNB has launched mobile-based services such as mobile banking, fraud alerts and mobile deposit. Mason said the rapid introduction of new technologies has made it easier — and cheaper — for FNB to offer these services. “That is a misconception sometimes that a small community bank, that they can’t have the (banking) products,” he said. Within the last year, for example, FNB started offering card valet, a debit card management service that allows customers to switch their card on and off or restrict access by GPS location. “If I lose it today, I can go in my phone, turn off my card, and now if somebody picks it up off the side of the road, they can try to swipe it somewhere, but it won’t work,” said Jennifer Vastano, senior vice president of marketing and retail administrator for FNB’s Pandora office. But Mason doesn’t believe FNB’s customers are ready to rid themselves of face-to-face interactions yet. “Most people can do everything that they need to do electronically, but what we’re finding more and more at all banking levels is that when it comes down to something that’s not a repetition transaction … they want a person there,” he said. Mason and Vastano believe FNB’s small size and close proximity to the communities it serves have helped the bank stay in business, even as more competition emerges. Likewise, Mason said FNB has no interest in opening new branches in large markets. “The fact that we get to celebrate 100 years as a community bank, there’s not a lot of institutions that can say that,” Vastano said. 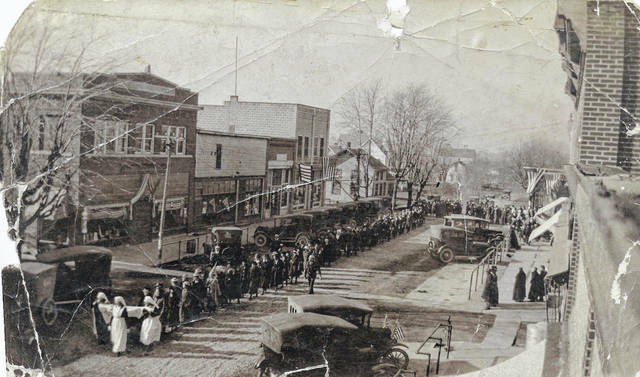 https://www.limaohio.com/wp-content/uploads/sites/54/2019/04/web1_1918pandoraparade.jpgThis photo shows Main Street in Pandora in 1918. First National Bank later purchased the barber shop along this road. FNB was chartered one year later, on April 23, 1919.